In early September 2010, a little known anti-piracy company admitted that in the course of their work they sometimes go the extra mile to end copyright infringement. India-based AiPlex Software said that when faced with uncooperative torrent sites they “flood the website with requests, which results in database error.” The admission, that the company engaged in what amounts to a distributed denial-of-service (DDoS) attack, started off a momentous chain of events. The confession irked the masses on the chat board 4Chan and many of its members, known as Anons (collectively ‘Anonymous’), plotted their revenge. Firing up their LOICs, they DDoS’d AiPlex in return, taking the site offline. But despite letting off steam the rage did not subside and soon the MPAA and RIAA were being overwhelmed with traffic, along with the Bank of America, Visa and Mastercard who had cut off payments to Wikileaks. Operation Payback was underway and it would spread around the world. In the three years that have since passed, authorities in various countries have rounded up some of those who coordinated and participated in the attacks. 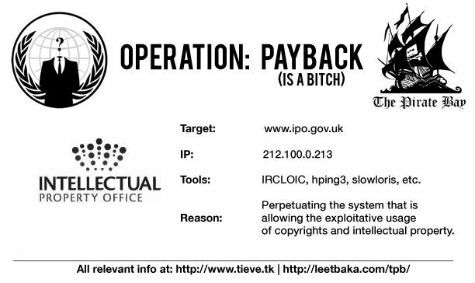 A few hours ago came the news that United States authorities have scheduled some payback of their own for more than a dozen Operation Payback participants. A federal grand jury has indicted 13 alleged members of Anonymous on claims that they “did knowingly cause the transmission of a program, information, code, and command, and, as a result of such conduct, intentionally cause damage, and attempt to cause damage, without authorization, to a protected computer,” including those operated by the Motion Picture Association of America, the Recording Industry Association of America, and the U.S. Copyright Office. The indictment states that 13 men coordinated attacks by collectively deciding on targets and publishing their names and IP addresses along with proposed times and dates for the attacks. Via online postings and fliers, plus through the IRC channels #saveTPB, #savethepiratebay, and #operationpayback, the men allegedly recruited more individuals to the collective. In addition to United States-based targets including Warner Bros., the indictment lists attacks on the IFPI, BPI, ACS:Law, Davenport Lyons and Ministry of Sounds websites in the UK, against anti-piracy group BREIN in the Netherlands, one launched in Australia targeting the Australian Federation Against Copyright Theft (AFACT), and another against French anti-piracy outfit Trident Media Guard. Overall the indictment tries to paint a very bleak picture of the defendants engaging in a deliberate campaign of destruction during the course of Operation Payback. It often cites comments made by each individual as they allegedly went about arranging and motivating others to carry out attacks against high-profile targets. “We do not forgive. We do not forget. Expect us,” is the Anonymous battle cry. **United States authorities appear to operate with a similar philosophy.